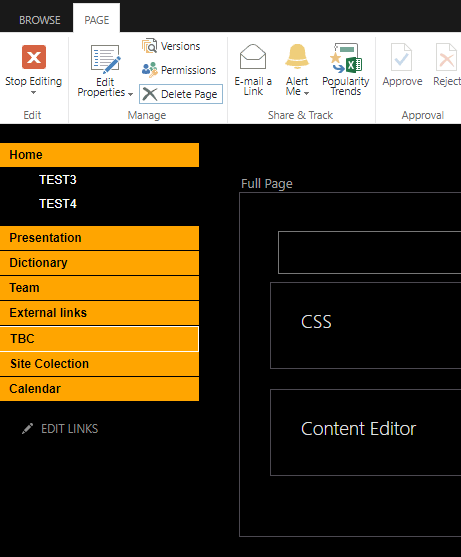 I'm very new in SharePoint and I've received the task to create an internal SharePoint site for our department. I searched a lot on internet regarding a way to add icons to quick launch menu but I cannot find anything from head to tail. For now I used CSS code. I tried to use JQuery, but again I'm new on this also. Can anyone help me with this problem? Hello, For the moment I was able to make the menu to colapse . Unfortunately I was unable to create arrows for the colapseble menu and I cannot add icons. Please , can anyone explain stept by step where should I put these codes for arrow and icons or to update these code accordingly? For the Icons code , I have to create other file or just put the code in the first file ? For now I use one CSS file and one JQuery files linked in Content Editor. Add below script to your Master Page. Refer here for step by step procedure and icon(+/-) files. Not the answer you're looking for? Browse other questions tagged sharepoint-online css quick-launch or ask your own question.